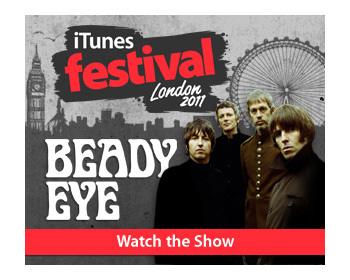 Beady Eye will be headlining at this year's iTunes Festival, taking to The Roundhouse stage in London this evening (Tuesday 5th July). For the first time iTunes will be streaming the Festival shows live through the iTunes store and the official festival app. Beady Eye are due to take to the stage at approximately 21:10 (UK time) and the full show will be available to stream live. After the show, the gig will be available to view through the iTunes store and app. Fans in the US and Canada can watch the gig live through www.livenation.com and www.ticketmaster.com.